MICHAEL GRANDINETTI | Love Productions Inc.
From close-up magic, to platform magic, to grand illusions, Michael Grandinetti can provide entertainment sized to fit any event and venue. Enjoy an unforgettable time with Master Illusionist Michael Grandinetti as he combines jaw-dropping platform magic with audience participation – creating an interactive experience that pulls you right into the magic. Live stage effects include borrowed finger rings vanishing and reappearing in a locked glass case, vibrant roses appearing in mid-air from a flash of light, an interactive card trick is performed with the audience using 3ft tall cards, randomly selected audience member’s minds are read and one of their thoughts is found written on paper sealed inside a giant balloon, an interactive effect is performed involving the entire audience at the exact same time, and much more. This high-energy show, combining grand illusion and stage magic with music, comedy, suspense, and audience participation, is perfect for venues from ballrooms, to theaters, to outdoor stages. You’ll be amazed as Michael shrinks a stunning dancer to the size of a basketball, vanishes half of his body, causes an examined piece of tissue paper to come to life and dance in the hands of an audience member, visibly cuts himself in half with a 24″ steel blade, successfully predicts the winning lottery numbers, gives the entire audience their own private lesson in magic, and for a finale, levitates high above the stage! 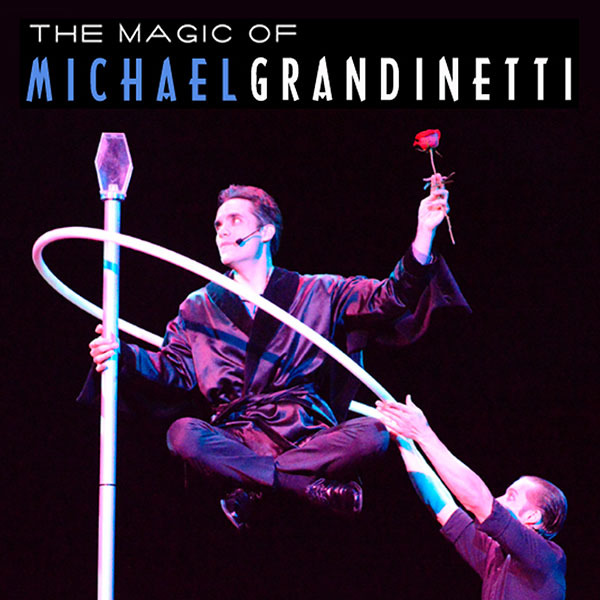 Michael Grandinetti’s full-scale stage production is a theatrical experience, including fan-favorite illusions from his international television and stadium appearances, that will leave a lasting impression on your audience. In this show, a 500lb motorcycle appears from thin air, a man melts through the spinning metal blades of a 5ft diameter industrial fan, a dancer is visibly pressed flat between two sheets of steel and emerges unharmed, borrowed objects travel through time, large-scale levitations are performed both on-stage and in the audience, and a daring escape is attempted above the stage with a surprise finish that has to be seen to be believed – and this is just the beginning of what you’ll see in Michael’s stage spectacular.